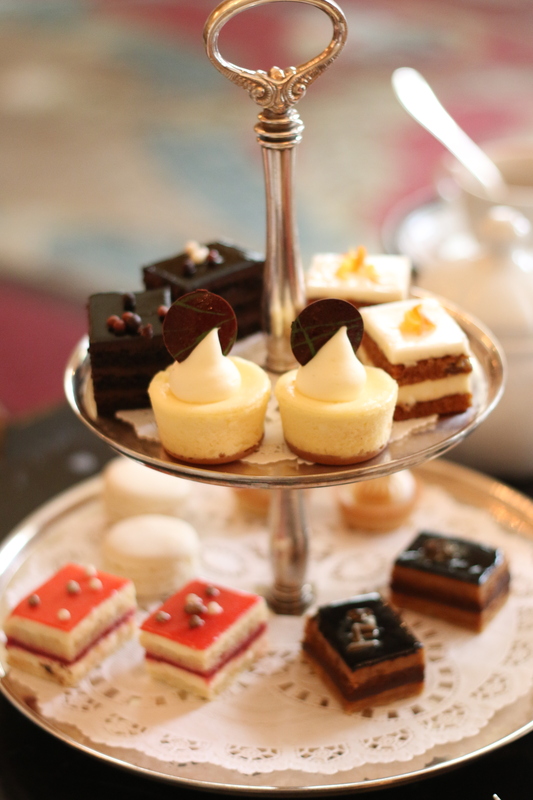 Westgate Afternoon Tea Review & Giveaway! 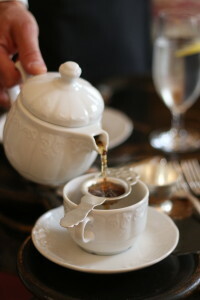 Lindsay’s Tea Party has fallen in love with the The Westgate Hotel. 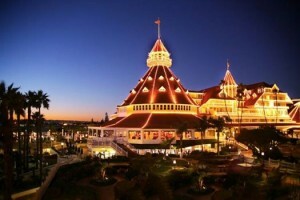 The Hotel is a one-of-a-kind luxury, boutique hotel in San Diego, California, completed in 1970. It is filled with priceless antiques and appointments one would find in an elegant home. 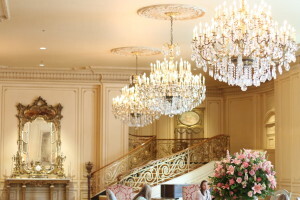 The Hotel was designed as a re-creation of an anteroom in the Palace of Versailles, the Grand Lobby is noted for its magnificent antiques, Baccarat crystal chandeliers, Flemish and French tapestries and Persian carpets. From the moment you enter the lobby doors, you are quickly greeted by friendly waitstaff and promptly seated in palatial sofas with soft pillows and chairs. The Afternoon Tea is so much more than tiny sandwiches and a hot beverage. This Hotel takes you back to an earlier time period, one of regal grace and charm, stunning antiques and vintage furniture that instantly takes your breath away by it’s glaring beauty. 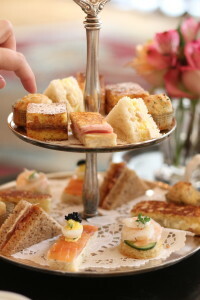 The Afternoon Tea provides a respite from ordinary life and everyday dining. You are quickly able to relax and rejuvenate to the melodious sounds of a harp while you indulge in a delightful array of delicious tea sandwiches, sweet pastries, scones and seasonal berries. Your choice of seasonal teas is included and may I highly recommend the English Breakfast or the Pear tea that provides an aroma so pleasing you don’t want to set down your cuppa. The Menu is not only pleasing to the palate but also filling. 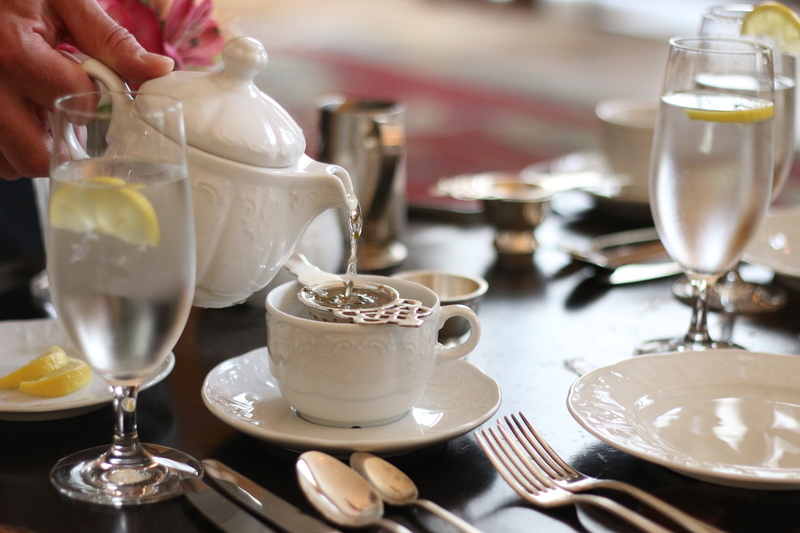 Seatings for their traditional tea service are offered Friday, Saturday and Sunday from 2:30 until 5:00 p.m. However, private teas can be arranged for your group. 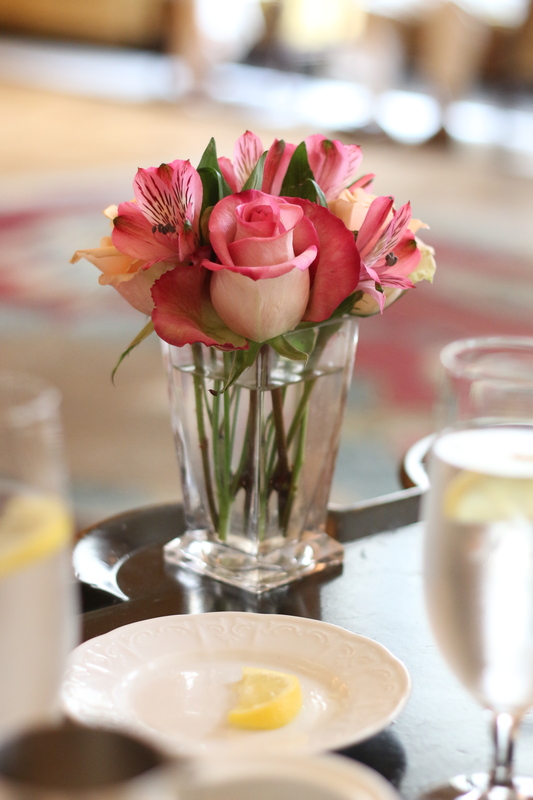 In addition to formal teas, champagne and wine are available for an additional charge during your visit. For a seating at your convenience, reservations are recommended. Now LTP is pleased to off one lucky reader a chance to win an afternoon tea for two at The Westgate Hotel! 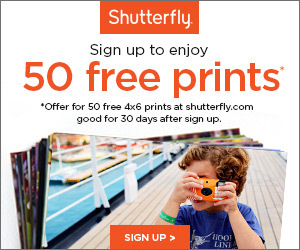 Contest begins, June 1st, 2015 and ends June 7th, 2015. As the Editor of LTP, I attend activities and events, receive promotional items and educational materials to use and share as I see fit. All opinions expressed are that of Lindsay’s Tea Party are honest and reflect my actual experiences. I would like to extend a special thank you to The Westgate Hotel for the opportunity to review it’s fabulous afternoon tea offering and share my highlights with Lindsay’s Tea Party (LTP) readers. No compensation was received for this post. 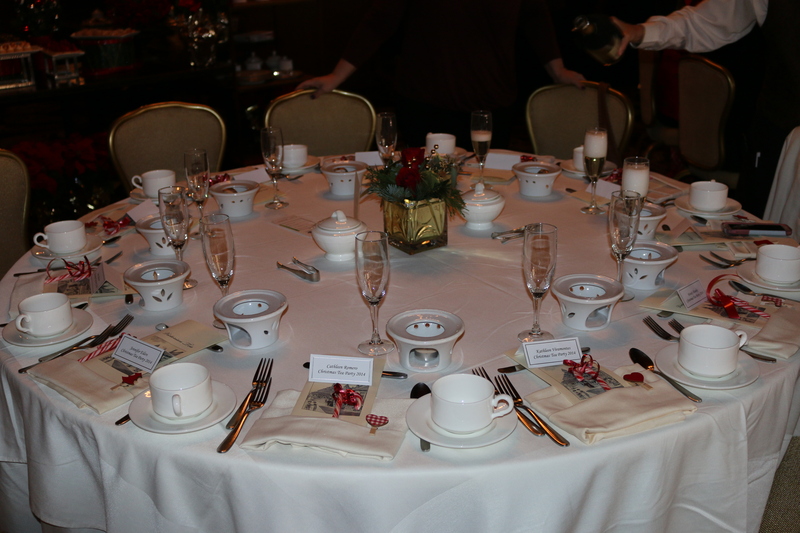 As many of you may know I have been hosting Christmas Tea Parties every year since back in August of 1998. 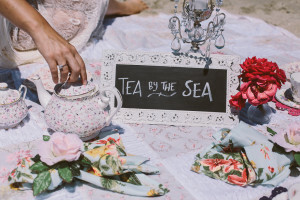 The first tea party was my very own “Bridal Tea Party” that my future mother-in-law at the time, hosted for me during the preparations for my wedding later that year! 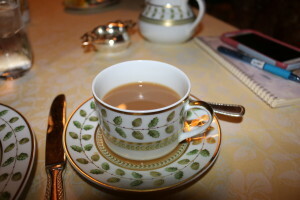 From this tea on, I was hooked, and ever since I have been hosting these annual friendship and Christmas Tea’s every year since. 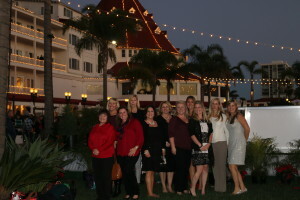 This year was a special year for our group, we celebrated our 16th annual tea at the beautiful Hotel Del Coronado! The site was breathtaking. 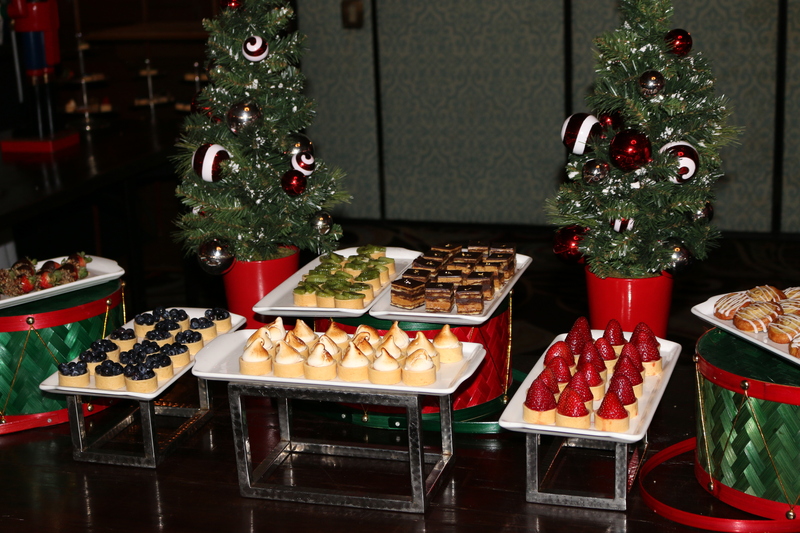 From towering and sparkling Christmas trees to the beautiful lights that twinkled throughout the hotel. The theme was “Glitz & Glam” and we sure sparkled up the evening! We enjoyed fabulous savories and sweets including bubbling champagne and sparkling apple cider! 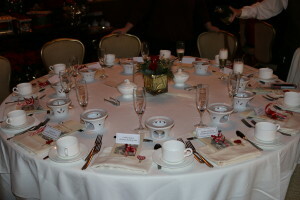 This year we added a fun tea cup and loose tea exchange. 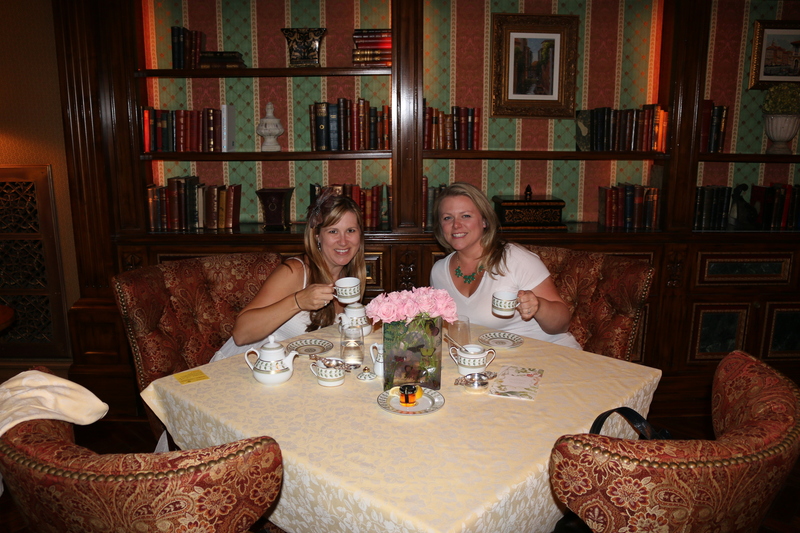 The teacups were beautiful and each unique in their own right. 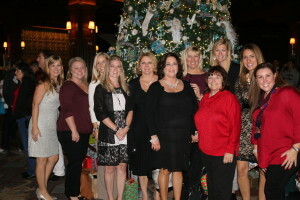 I am thankful for these friendships that have surrounded me all throughout the years and the opportunity each year to ring in the new coming year with such fabulous ladies. 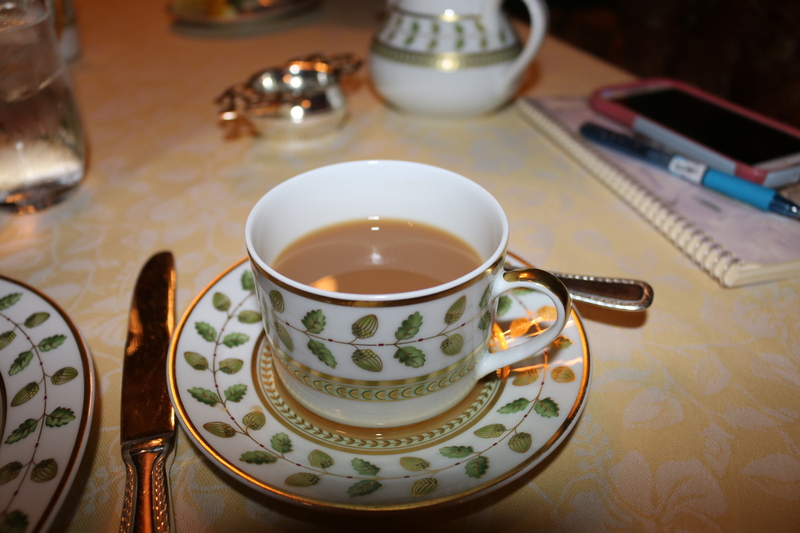 Until next year, cheers to my LTP gang, this year’s tea is one I will never forget! 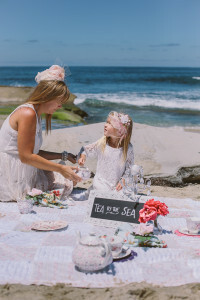 End of Summer Tea Party! It’s that time of year, when the days seem short, the nights even shorter and before we know it we will all be back to the schedules and confinements of what we know as, “BACK TO SCHOOL” season! Well, LTP isn’t quite there just yet. 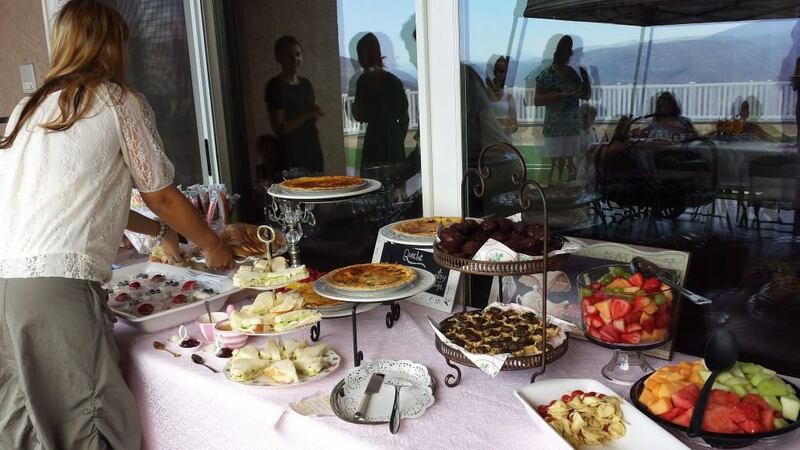 Recently, I had an afternoon Tea Party with all the Summer Mom’s to refresh and catch up on all the busyness that comes with Summer time! One detail that I don’t want you to miss is the importance of knowing how many people to anticipate or plan for at your events. I recently read an article that shared that nearly 80% of folks do not respond to an invite they have received from a friend or family member. This does not mean that he or she does not plan to attend the event, it simply means, they did not RSVP. Well, research shows that if you send a memorable invitation, this statistic drops down to only 40% lack of RSVP’s. 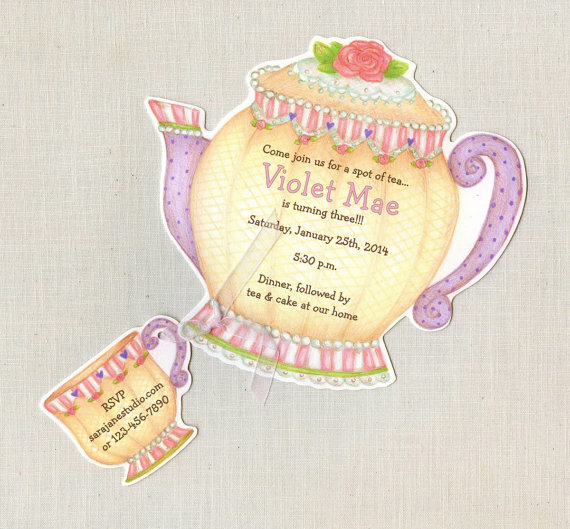 They are beautifully handcut personalized Teapot Birthday Invitations, coordinating envelopes and self-adhesive envelope seals are also included. The invitation is started with a print of Sara Jane’s artwork. From there, your pertinent information is added along with any additional information you may want on the attachment. Each invitation is approximately 6″ x 6″. POSSIBLE INFORMATION: Party Date, Time, Place, RSVP information, other special notes. You can also change the lead-in saying if desired. NOTE: If you are looking for a specific number of invitations, you can request Sara to customize your order. 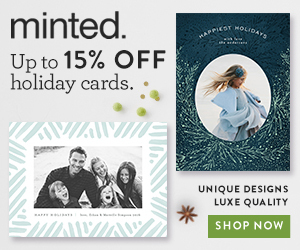 They also offer a discount for larger quantities of invitations. 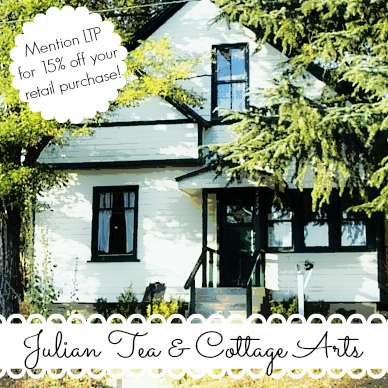 Message from Sara Jane Studio: All of the stationary here is based on my own artwork. As a mommy of five young children, I am always creating my own announcements, invites, and cards. Not only do I enjoy creating them, they are affordable, personable, and unique. Soon I was designing stationary for many of my family and friends. 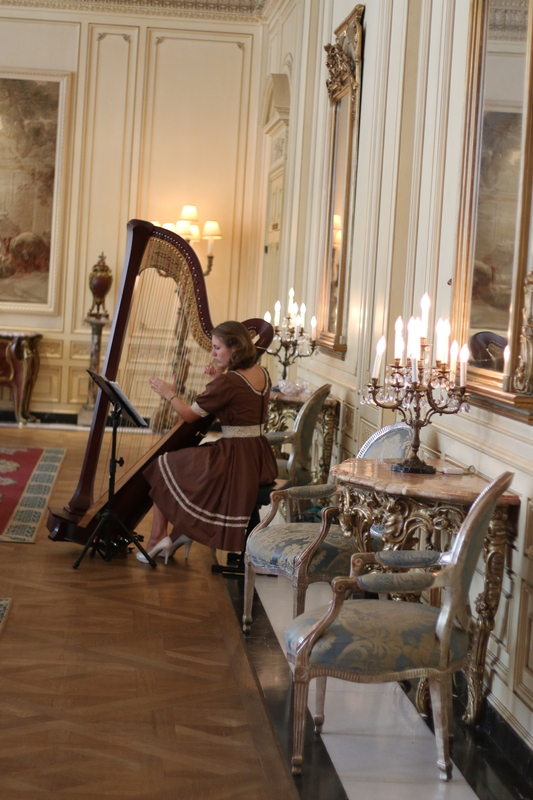 I have found it to be such a privilege to play a part in important events, such as weddings, showers, and birthdays. In fact I enjoyed doing it so much, I decided to set up this shop. My goal is to provide you with totally unique but affordable stationary that cannot be found elsewhere. 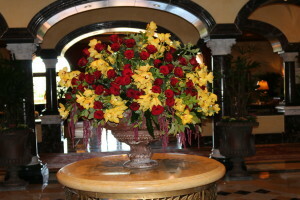 I love doing custom work so if you are unable to find what you need or looking for, please let me know. As the Editor of LTP, I receive products, promotional items and educational materials to use and share as I see fit. 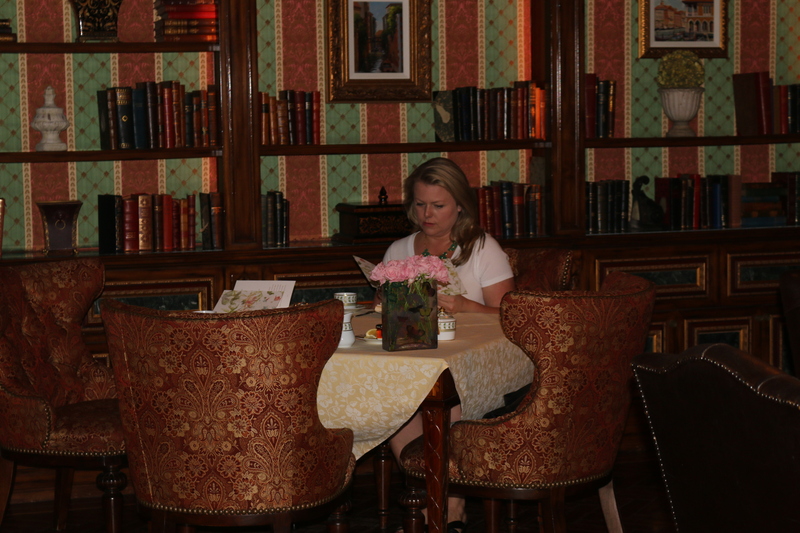 All opinions expressed are that of Lindsay’s Tea Party are honest and reflect my actual experiences. I would like to extend a special thank you to Sara Jane Studio for the opportunity to feature her fabulous invitations and share my experience with Lindsay’s Tea Party readers. I will definitely be back for more high quality paper products and designs. 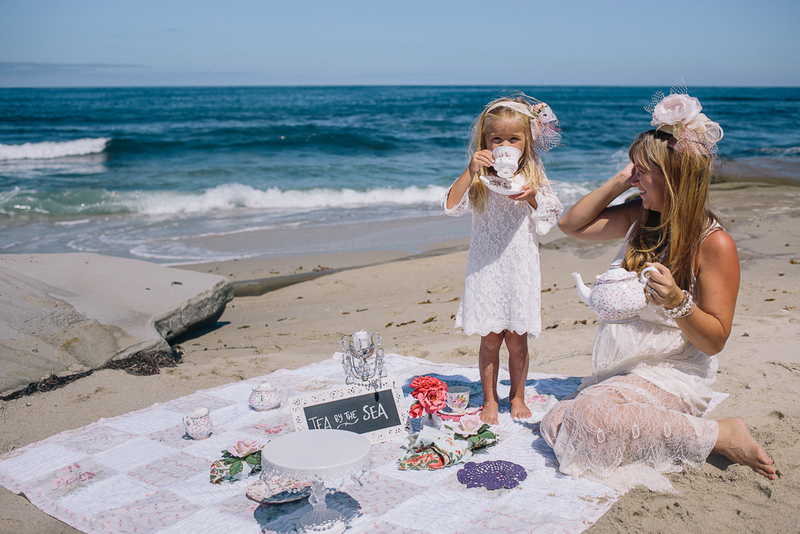 A Mommy and Me, Tea by the Sea! 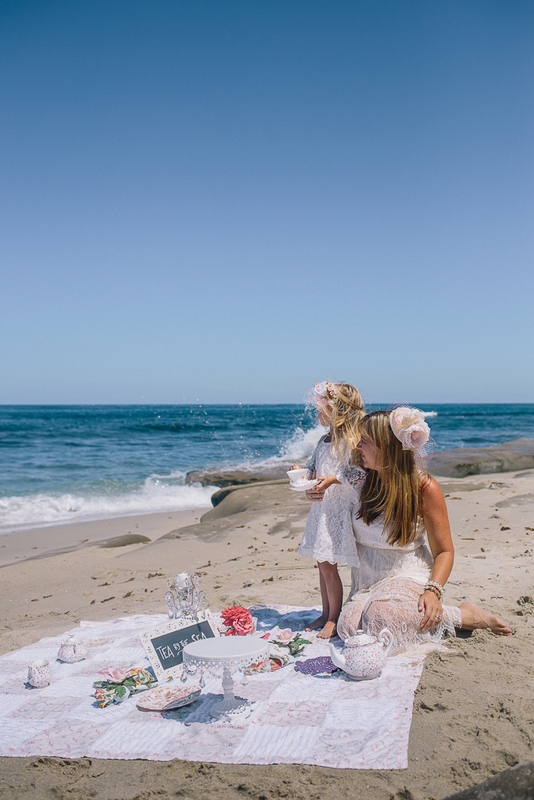 Summer is here and the San Diego beaches provide the most pristine sand and clear blue sky, just perfect for a “Mommy and Me Tea Party”! 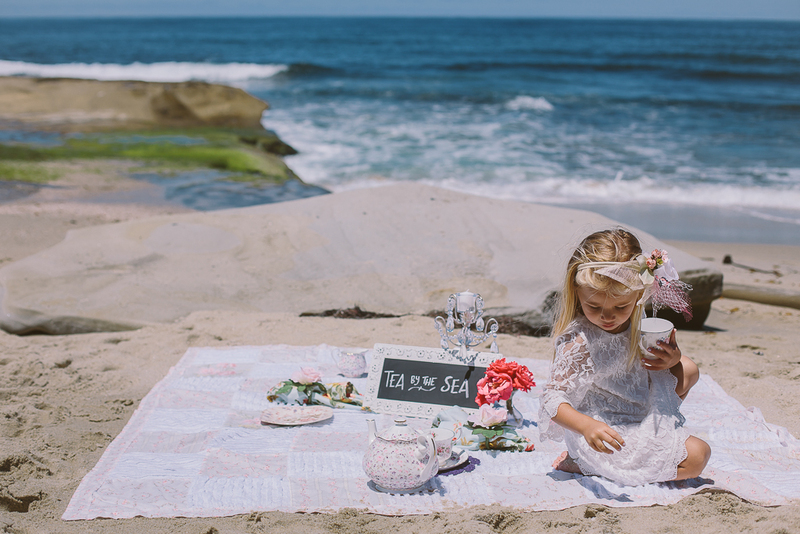 Lindsay’s Tea Party searched high and low and found some “must haves” for your next “tea by the sea”. 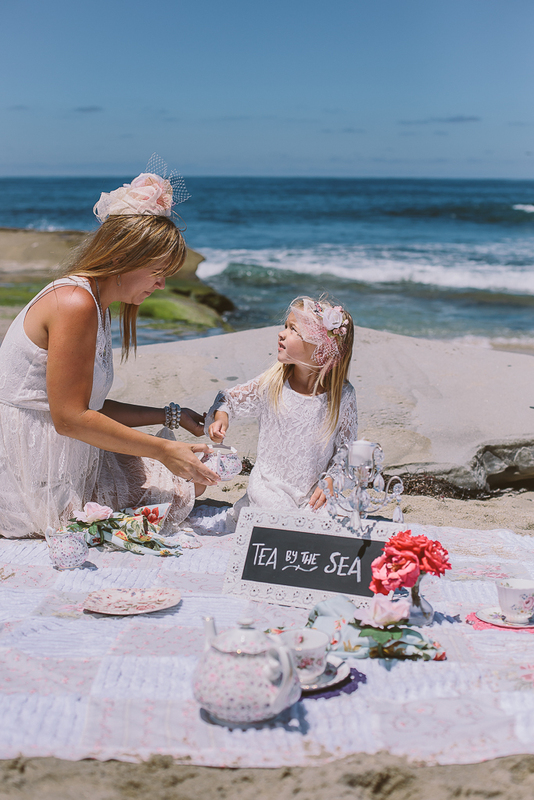 A tea party essential is the British inspired facinator. We found the perfect pairing for a Mom and a Toddler at Jill Courtemanche Millinery in Solana Beach, California. 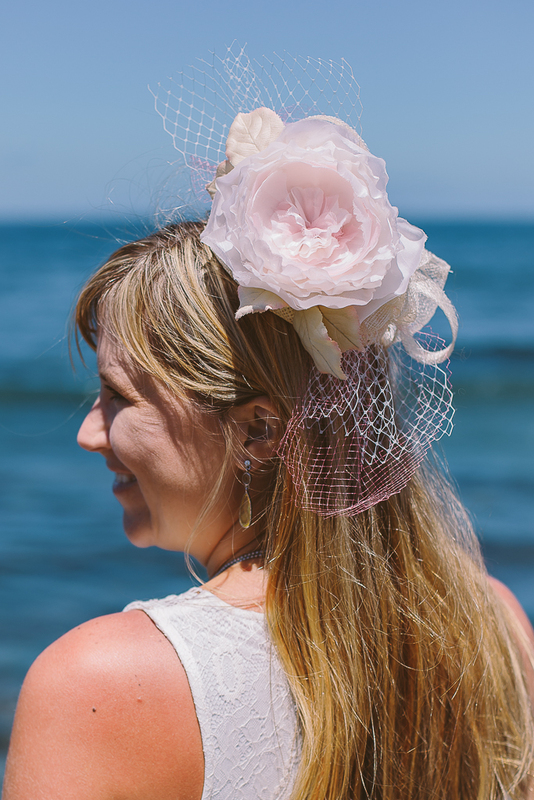 Jill brings a young, feminine and contemporary approach to her hats while incorporating traditional techniques and craftsmanship. All of her pieces are created using vintage materials, trims and embellishments combined with modern fabrics, and many styles are produced in limited and exclusive quantities. The ladies version is called “Fete” and is an open weave straw cocktail hat in ivory trimmed with a hand made silk peony in ivory and pale pink, open weave straw loops and bow and French net veiling. The retail price is $340.00 and the hat can be made in custom colors as well. LTP just loves the peony and we often choose these flowers in our many tea table arrangements and settings. 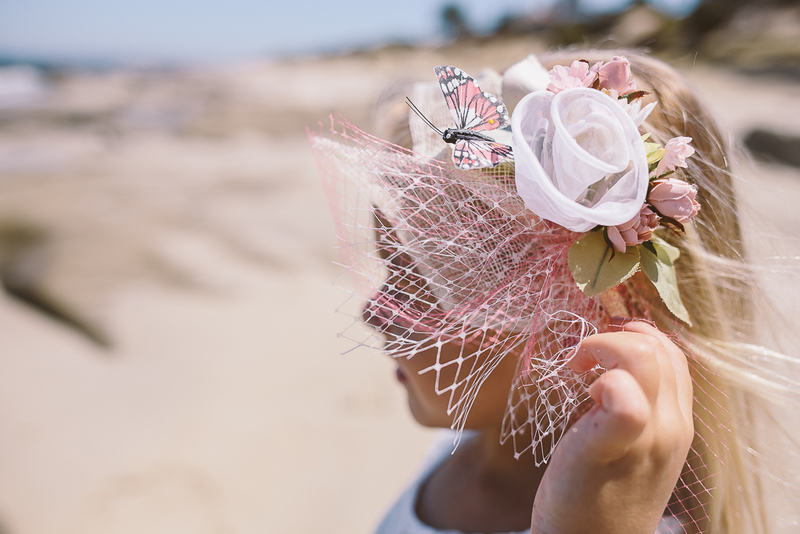 The toddler girls headband is a custom piece which would be available by special order and can also be made in custom colors. 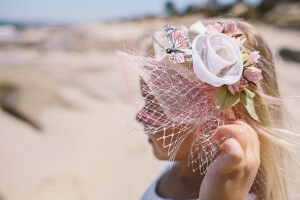 The piece is made of petite silk and cotton flowers with open straw loops and French net veiling (and a sweet little butterfly tucked in there). Please note the headband is metal so it’s flexible and within reason you can expand or contract it to fit the child’s head size. Next, we must talk lace, over at LTP we just cannot get enough lace this season. The vintage look, the soft feel, the elegance that is brought with each see-through piece as it flows and glides in the breeze. 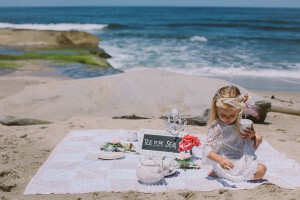 For this beach tea, the girls dress, known as the “Autumn Lace Dress” is designed and made by Kona Mali Creations. Tutus, headpieces, and theatre have long been a part of Donna’s life. 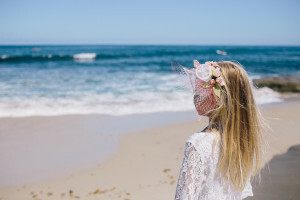 As a former ballet dancer, she lived to wear tutus and beautiful headpieces. Now as a stay at home mother of two prima ballerinas and one handsome little boy, they have inspired her to create timeless children clothing and accessories. 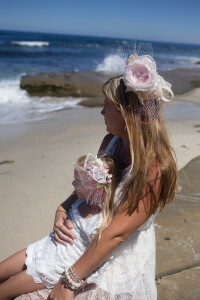 In the store she carries a wide selection of beautiful unique and affordable necklaces, hair accessories, tutus, chic inspired dresses and much more for your precious little one! 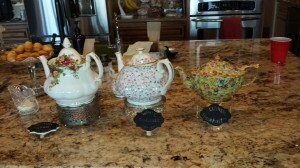 The accessories are perfect for special occasions and just about any tea party! This timeless off white delicate lace dress has beautiful scalloped edges on the hem and 3/4 sleeves, giving it a touch of elegance. To be as soft as an embrace the interior of the dress is made of cotton lining, which makes it soft and gentle. All seams are surged for durability and a professional finish. 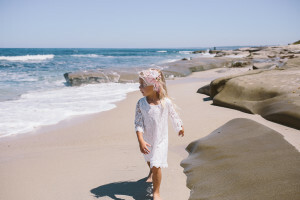 This vintage dress is versatile; it would be perfect for a flower girl, a birthday girl, portraits, or any special occasion and also comes in a cream/ivory lace color as well. Please keep in mind the dress was designed to sit above the knee as a mini dress which is fun for for all ages. This adorable dress retails for only $39.95 and has become a favorite of LTP fashions for children. As the Editor of LTP, I receive products, promotional items and educational materials to use and share as I see fit. 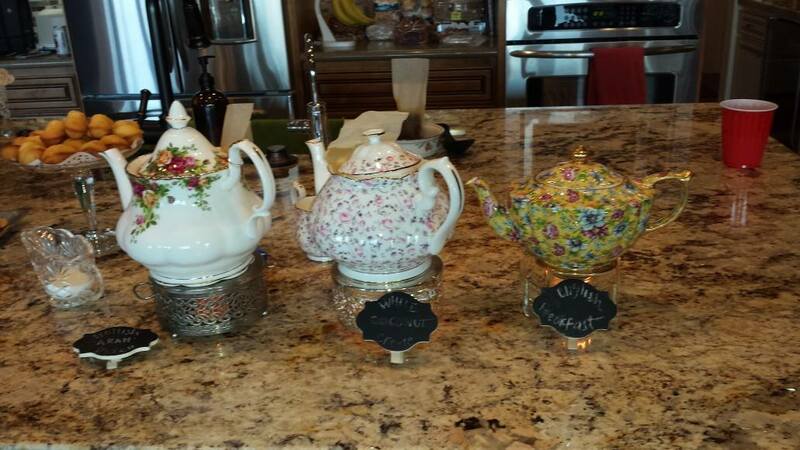 All opinions expressed are that of Lindsay’s Tea Party are honest and reflect my actual experiences. I would like to extend a special thank you to Jill Courtemanche Millinery for providing the beautiful facinators shown in this photoshoot. I would also like to thank Kona Mali Creations for the beautiful toddler girls Autumn Lace dress used in the beach photoshoot. And lastly, LTP would like to thank our resident photographer, Lindsey Marie Photography for capturing our fabulous tea party by the sea experience and enabling me to share my experience with Lindsay’s Tea Party readers. A special thank you to Wind & Sea beach in sunny, San Diego, for providing us yet another, perfect, and glorious day by the sea! 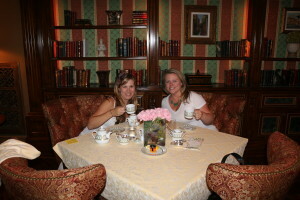 Lindsay’s Tea Party had an exquisite afternoon tea at The Grand Del Mar. Upon arrival the polite staff immediately parked our car through the valet services. 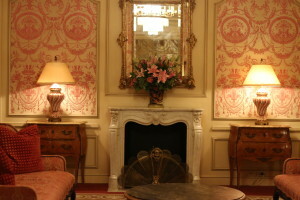 After locating the Library we entered a beautiful room filled with books and quaint antique chairs, crisp linens and stunning wood moulding throughout the ceilings and walls. 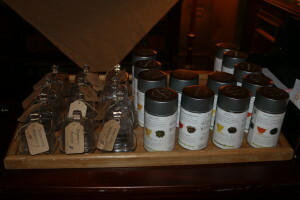 A waitress quickly seated us and offered us a variety of teas to choose from. 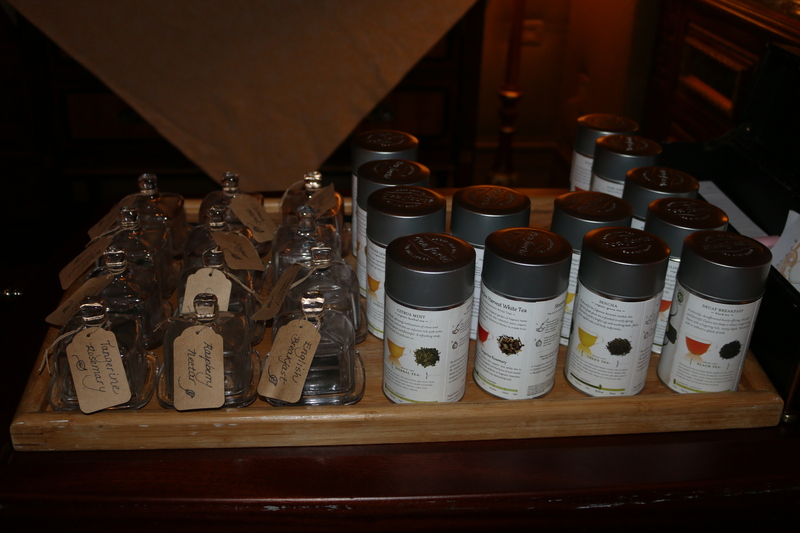 There was also the option to stop and sniff any of the nicely labeled jars filled with the loose teas before deciding upon which one to begin with. We chose the traditional English Breakfast and the Ambrosia (with coconut). tease of island coconut. Delicate, refreshing. 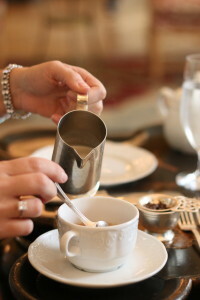 Both teas were fabulous tasting and piping hot served with honey, sugar and creme. Then the first of the 3 tea courses arrived. 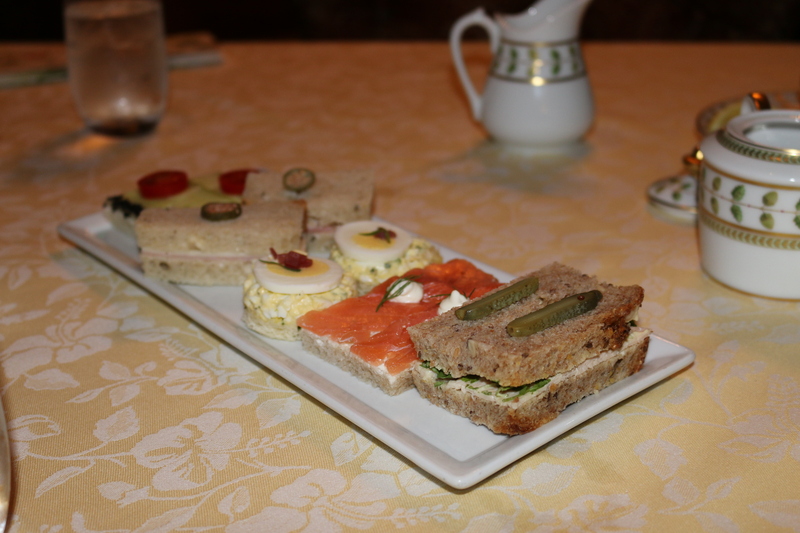 First course included superb tea sandwiches a mixed variety including salmon and cream, cucumber cheese, egg salad and cheese and ham. 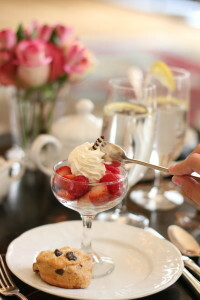 Then came warm and fresh scones. 2 types for each of us. A plain scone and a cranberry, served with lemon curd, freshly made house preserves and the traditional Devonshire cream. 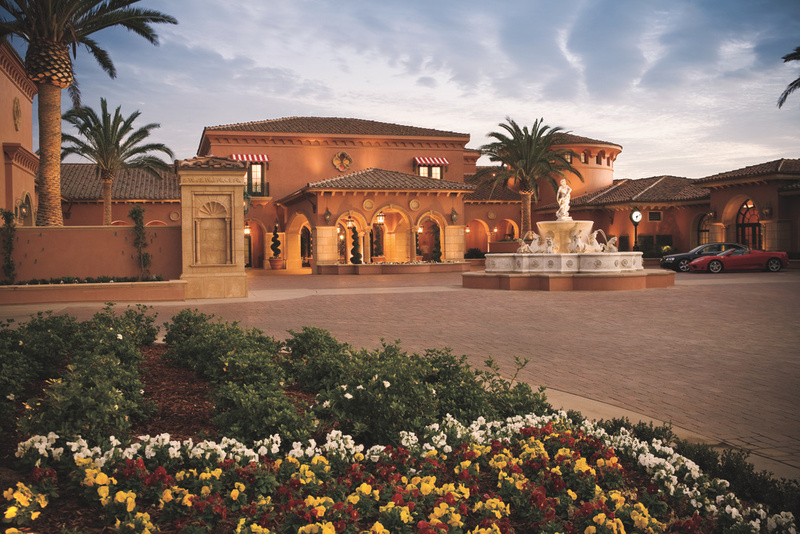 The Grand Del Mar welcomes you for an elegant afternoon in the comfortable setting of this luxury San Diego resort’s Library. 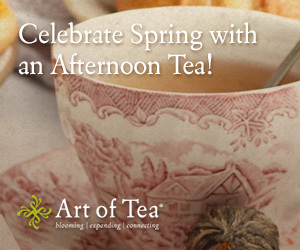 Enjoy beautiful music and a perfect pot of fine tea, or glass of wine, with pastries and tea sandwiches to complete this time-honored tradition. As the Editor of LTP, I receive products, promotional items and educational materials to use and share as I see fit. 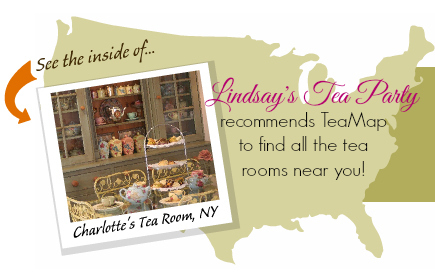 All opinions expressed are that of Lindsay’s Tea Party are honest and reflect my actual experiences. I would like to extend a special thank you to The Grand Del Mar for the opportunity to try its fabulous afternoon tea experience and share my experience with Lindsay’s Tea Party readers. 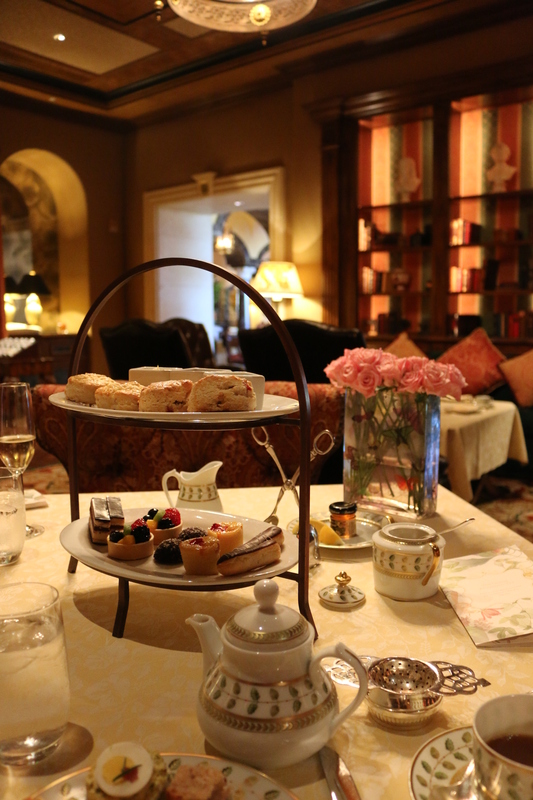 I will definitely be back and had a stunning afternoon tea experience.